Please Listen For Announcements, 2015. 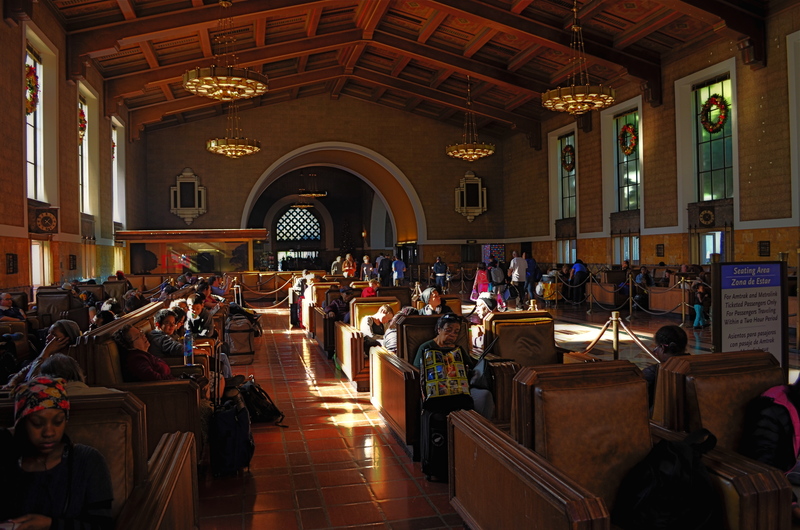 The iconic waiting room at Los Angeles’ Union Station terminal. SHOW ME A HOLIDAY SEASON AND I’LL SHOW YOU PEOPLE WAITING FOR SOMETHING TO HAPPEN. They form lines for special orders, last-minute items, a kid’s brief audience with Santa. They hope to bump someone on a flight, beat someone out of a bargain, talk someone into a discount, refund or exchange. But mostly, they wait. For as many festive holiday subjects that dance before the photographer’s eye, there are many more scenarios in which nothing much happens but..the waiting. And, while this seemingly endless hanging-out never offers images that define joy or wonder, they are fodder to the street shooter within us, the guy looking for stories. Stories of tired feet. Tales of people who can’t get a connecting flight ’til tomorrow at the earliest. Sagas of mislaid plans and misbegotten presents. Folklore of folks who are lost, lonely, disappointed, and down. In short, all of us, at various times. Transit points are often among the most poignant during the season, with legions of faces that plead, what’ll I get for her? How will I get all the way down this list? How soon can I get home? Your best bet? Hang at the train stations, the port authorities, the airports, and hear the plaintive strains of I’ll Be Home For Christmas sung in the key of ‘as if’. Seek out those aches, that weariness, the many false starts and stumbling finishes of the holidays. And keep your camera ready, hungry for whatever visions dance in your head. This entry was posted on December 1, 2015 by Michael Perkins. It was filed under Americana, Candid, Christmas, Conception, Holidays, Los Angeles, Street Photography and was tagged with HDR, Holidays, Los Angeles, lowlight, transit, Transportation, travel. Wow. Stunning. I love the painterly feeling about this image. I shot three bracketed exposures with the intention to blend them in Photomatix in a standard HDR, but the bracketing was too wide and the middle exposure was nearly black, hence useless. I took the brightest exposure, duped it, jacked its contrast to the dark side and processed the two copies of the single shot as an ersatz HDR instead.The flesh textures come off a bit more unreal that way, hence the somewhat painterly effect. I don’t always like the results of such saves but in a deeply atmospheric shot it can work. Michael, thank you for the detailed response. Bracketing can be problematic in low light. I find that I’m getting too much noise to compensate in postproduction to use two stop differences. It all comes down to light. Stories of tired feet, what a great caption for the atmosphere of the picture. At least at Union Station in L.A. you get the best chairs! Never been there, need to try it out. Write our own story of tired feet.